"Residents get to enjoy all of the amenities of the Four Seasons Hotel. Also attached are the Bloomingale's store and the Shops At 900 North Michigan Avenue. 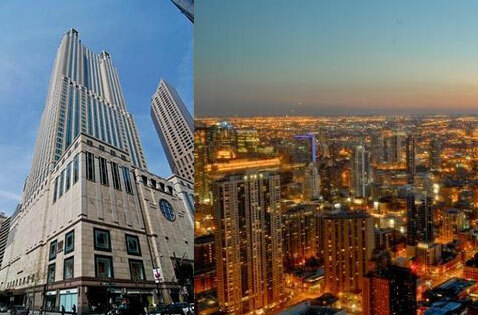 132 E Delaware is one of the true luxury buildings of Chicago." Towering 66 stories above Michigan Avenue, 132 East Delaware is home to both Bloomingdale's and a Four Seasons Hotel on its lower floors so that residents can enjoy the views from the upper floors. The residences are part of the 900 North Michigan Avenue building which is opened in 1989 and includes hotel, residential, and commercial portions. Because of its prime location, residents experience the convenience and luxury of living moments from the lakefront and the shops and restaurants on Michigan Avenue. First-class amenities are available to residents of 132 E Delaware including all of the amenities for the Four Seasons Hotel. The spacious and unique floorplans at 132 E Delaware include fully-equipped chef's kitchens, formal dining areas, walk-in closets and large windows feature stunning views of the city and lake. Dogs and cats are welcome and garage parking is available.